No, it's not an end-of-the-world disaster pic, and no, I don't know what happened to the other six days. Nope , 7 DAYS is the weirdo name of an individually packaged croissant that should be coming to a store near you . Except it didn't come to a store near me till Laura found it in a little mini-mart Saturday morning . I've been looking for these things since I saw their commercial on TV a couple of times . Have you seen this thing ? It's got a EURO feel to it , kinda like the old MENTOS commercials . You know , real lame . Well anyway . 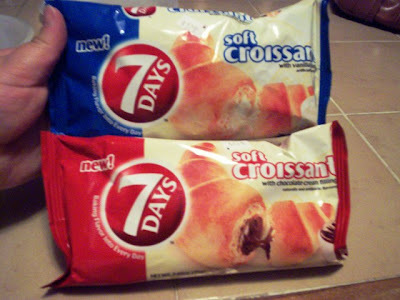 in the ad , a guy and gal meet up on the street and it starts raining down these packages of 7 DAYS , which we're informed are soft croissants with creamy fillings .They open their packages , take big bites and smile BIG toothy smiles and they fall in love or something , I'm not quite sure . Anyway , Laura brought home 2 , one with chocolate filling and one with vanilla . She also said there was a third with cherry filling . Are there more ? I don't know . The ads had only mentioned the chocolate filled . Their claim to fame seems to be that the croissant will always be fresh . On the package it says , BAKING FRESHNESS INTO EVERY DAY . WOW . They were only $ 1,29 each and they're a good size but I don't think you'll want to eat them every day . At 330/340 calories each , with 60% saturated fat and 14g of sugar , I think these might have to be a once in while treat . I won't tell your doctor if you don't tell mine . VERDICT: Of course they're tasty ! With all that fat and sugar , how could they NOT be . LOL! The creamy fillings remind me of the old PUDDING PIES . Remember those ? They were from Hostess or Drake's or something .They were filled with sweet and creamy pudding . And so are these , very reminiscent . But this is what impressed me most . The croissant itself was terrific . I expected dry falling-apart pastry . 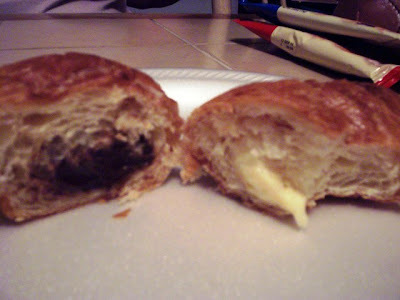 But it had a fresh , flaky , buttery taste and texture that really surprised me . Sometimes my local Dunkin Donuts croissants aren't this soft .They'd make a really nice breakfast treat with your coffee in the morning , if you can spare the calories . Just make sure to take you're blood-sugar later , to see if you're OK . LOL! I know your taste-buds will be happy . Who cares if your doctor isn't ? He gets too much of your money anyway . 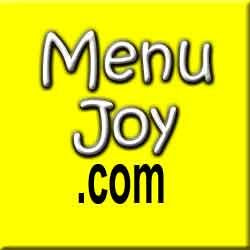 Visit our friends at MenuJoy.com to see dozens of local area menus for your eating pleasure.